Picking up from the prior night, Daniel the Canadian (not shown: Canadian flag speedo) arrives just in time to play Rose Ceremony hero for Christen or Jasmine. But Daniel actually ends up being the hero for Lacey, who has allegedly been awaiting his arrival. Definitely a surprise considering how horrible their conversation went. 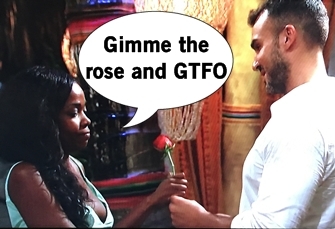 Jack Stone gives his rose to Christen and then special guest Matt re-appears from the sidelines to give Jasmine his rose before departing... again. The Rose Ceremony remains on course with all the couplings, with some alleged suspense with the triangles. Adam chooses Raven over Sarah, Dean picks Kristina instead of D.Lo, and Ben Z can't pick his dog since he's not in Mexico so he chooses D.Lo. Great, let this Dean triangle drag on forever! Sadly, we lose Sarah and Alexis, the life of the party. Pour out a marg for the Shark/Dolphin queen. Everyone's hangover sleep is interrupted when a Mexican wrestlers raid the house to drop off Daniel's date card. Daniel ultimately chooses Lacey for their wrestling date, complete with shiny costumes and a BIP Championship belt. When they return to the resort and get cozy, Jasmine interrupts and takes Daniel away. 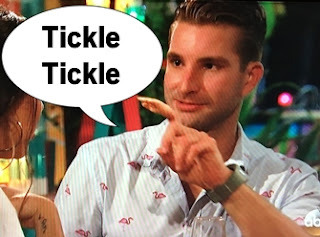 Jonathan the Tickle Monster strolls in Paradise with a date hard in his left hand, and the right hand ready for a good squeeze. He hits it off immediately with Christen, and after a kiss they head out on a date together. Turns out, the Tickle Monster has less creepy things in his life like being an actual doctor and surfer. Christen and Tickle seem to hit it off, but Jack Stone snags her again and gets a kiss. And then it's back to this Dean nonsense. As you may recall from every other episode thus far, Kristina feels like Dean is pulling away. Despite wanting to keep things going with Kristina, he still continues to flirt with Danielle right in front of Kristina. Kristina is miserable and crying and says her orphanage is better than Paradise. Well put that in the promos! Much like last week, the show cuts to an in studio special to interview Corinne about her side of the production shut down, and then trying to balance their heaviness with tone deaf segments about all the fun in Paradise. Pass.